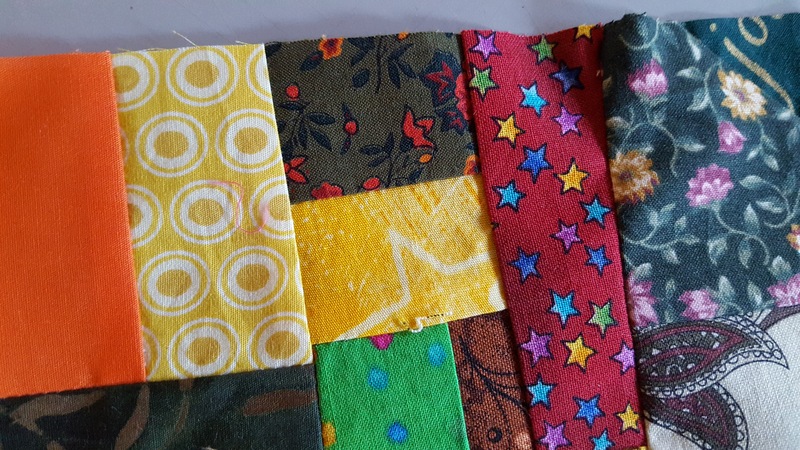 On her While She Naps blog, quilter and designer Abby Glassenberg describes a new project, a quilt with 99 hexagons, each one representing a fabric in her stash. “I’ve had some of these fabrics for more than 10 years,” she writes. I can beat that. I have at least one little piece that’s half a century old. And it has a history. In 1968 or 68, I bought a full dirndl skirt at a thrift store in or near Tulare, Calif., when I was in high school. I took the skirt apart and used the resulting several yards of fabric to make an A-line knee-length dress. I sewed a wide band of ecru lace a few inches above the hem. That dress is inextricably aligned with a memory of waiting in a house in Visalia (nearby college town, albeit junior college) to be introduced as the recipient of some sort of scholarship. The details of the award are murky–I think it was related to music, although while I was intensely interest in music and was soon to start at Berkeley as a music major, I really wasn’t that good at either violin or piano, and my singing was confined to the choir at St. John’s Episcopal Church in Tulare. But this house! There was such an air of refinement, of everything being in its right place. It had the solidness of good construction, good bones, so removed from my family’s cluttered modern ranch, with its drywall construction and wall-to-wall carpet over plywood floors. I think that year, 1968-69, which I spent at College of Sequoias before transferring to Cal, was the first time I actually met anyone with a Ph.D. I was in awe of such learning. I wanted to be smart like that, well-read, cultured. And there I was in my homemade dress with my neat blond hair and glasses, smiling shyly and hoping I more or less fit in. I remember polite applause. I still can’t recall why. I have only the small piece, a few inches, of that long-ago fabric left. 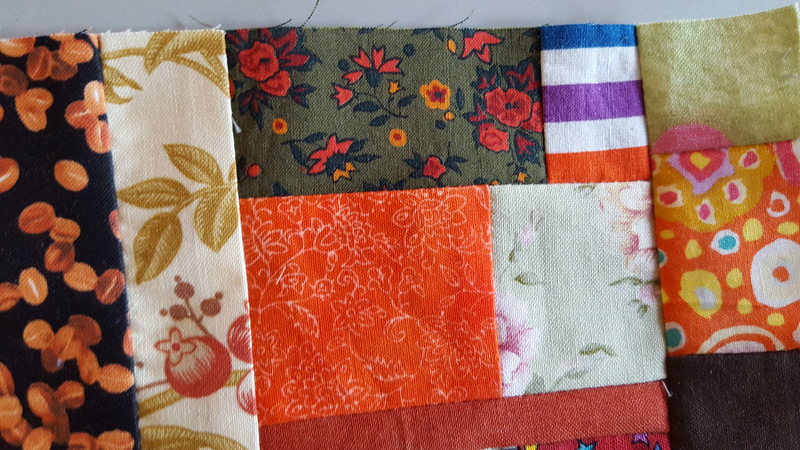 Some of the little swatch I kept all these years has gone into various quilts, as in these crumb quilt blocks. While I was looking for that little scrap, I found a few other old pieces, far older than Abby’s 10 years. This floral fabric was a gift from my brother Michael, and it went into a top I wore to work in my first days at The Oregonian in the mid-1970s. It was sewn on my mother’s 1948-vintage Singer, which I carted off to college and kept till 2014, when I traded it in on a shiny new Pfaff. Even though I hadn’t used it in decades, I was instantly remorseful. It really was a beautiful machine. And here are a fabric and its negative, pieces of a dress I made for Lyza when she was about 3. I was so proud of that dress, which I made on a treadle machine I had bought in about 1976–it was so much more relaxing to sew on than the Singer. The first time Lyza wore it, she slid and fell on an oil patch in the garage. Most of the oil eventually came out in the wash, however. I still have a few snippets of penguins on green fabric that dates to the 1980s, when I made tea cozies for Christmas gifts, keeping the penguin one for myself. So many of the hundreds of scraps in my collection breathe memories. Sometimes I’ll go through a box or two of them, rearranging the pieces and listening to the voices of the past. This entry was posted in Create, Fabric, Happiness, making, Things I made. Bookmark the permalink. OHhhhhh, Fran…I can’t tell you how much I love this article and the photos that illustrate it. I feel the same about certain pieces of cloth that bring back memories and the only thing I ever made with all the old cloth is now gone, but the memories are still here. My children used to say things like “Oh, that’s from the lookalike shirts you made for Dad and me” and “There’s grandma’s dress that she wore all the time.” Those small pieces of fabric were like looking at old photographs. 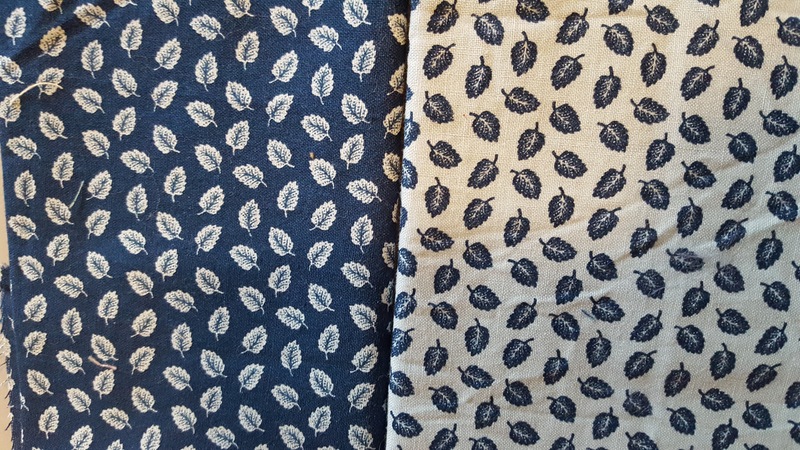 Even my two-year-old daughter, now grown up, pointed to a square and said, “Mine.” She recognized her dress fabric. Fabric and Memory sounds like the title of a good book. I also could feel your angst and awe when in the professor’s home. This piece should be in one of the Chicken Soup Books. Go online for their instructions for submitting a story. If accepted, they pay $100. I am SO serious.